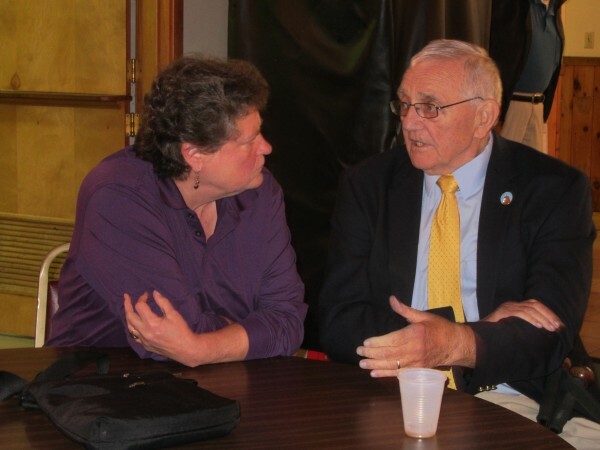 Sen. Edward Mazurek speaks with Anne Beebe-Center during am event that honored the retiring legislator as well as was for raising money for a local home heating assistance program on Thursday in Rockland. ROCKLAND, Maine — Edward Mazurek has been part of a world championship Little League team, played a year of professional football, and taught and coached for four decades. Through it all, the Rockland man said politics has always been an interest for him. The community that he has been a part of since the 1970s honored the retiring Sen. Mazurek on Thursday night during an event that was coupled with a fundraiser for a local heating assistance program. And members of the community, from across the political spectrum, spoke of his success and commitment to the Rockland area during the event. Former state Rep. David Miramant of Camden, a Democrat, and Rep. Jeffrey Evangelos of Friendship, an independent, said Mazurek was their mentor when they got into the Legislature. Miramant said Mazurek’s influence made him a more effective legislator, while Evangelos praised the Rockland man for his time in helping him. Former Rockland Mayor William Clayton, a Republican, also heaped praise on Mazurek. Clayton had Mazurek as a teacher at Rockland District High School and also followed him onto the City Council and the mayor’s post. “Regardless of what political party you are in, you have to respect the amount of time he has given his community,” Clayton said. Mazurek attended the benefit a day after the death of his 20-year-old granddaughter Taylor, who succumbed to an unexpected medical condition. Organizers of the benefit said that Mazurek insisted on coming despite his family’s loss because of his commitment to raising money for the heating fund. Money raised at the event went to Penquis to supplement its home heating assistance program for low-income county residents. Mazurek grew up in Stamford, Connecticut, and played first base for his Little League team. That team went on to win the world championship in 1951. Mazurek said he doesn’t recall how he did at the plate but remembers being solid in the field. The Stamford team defeated Austin, Texas, 3-0 for the crown. He and his fellow baseball players then earned a Babe Ruth national championship three years later. After high school, Mazurek went to Xavier University in Cincinnati and majored in business. He played football on the Xavier team and was drafted in 1960 by three professional teams. The Boston Patriots in the new upstart American Football League drafted Mazurek as did a team from Montreal in the Canadian Football League. Also drafting Mazurek was the Chicago Cardinals of the National Football League — the team that signed him. The team was relocating to St. Louis and became the St. Louis Cardinals. A defensive player, Mazurek was traded midseason to the New York Giants. Mazurek finished out the year with New York. “I was a little bit slow, I guess,” Mazurek said about why he didn’t continue on in professional football. With his professional playing days over, Mazurek said he still wanted to participate in sports and went to Fairfield University in Connecticut, where he got an education degree so that he could teach and coach. His first job was at Central Catholic High School in Norwalk, Connecticut. There, he coached football, baseball, basketball and softball. “They had so few people who wanted to coach, so I coached anything they wanted me to,” he said. His teaching and coaching career then went to Barrington, Rhode Island, for four years and for the next three years were at Triton Regional High School in Newbury, Massachusetts. Then came a social studies and football coach opening at Rockland District High School in 1975. For the next 35 years, Mazurek taught social studies and coached football and softball at Rockland District High School. Upon his retirement, the veteran educator said he decided to follow his other passion — politics. “I’ve always enjoyed politics. I served on the board of representatives in Stamford many years ago,” he said. Mazurek was elected and was the top vote getter when he ran for the Rockland City Council in 2001. He served a single three-year term and was twice elected mayor — a ceremonial post in Rockland that runs the meetings — by the other councilors. He was elected to the Maine House in 2004 to represent Rockland and part of Owls Head and re-elected by wide margins in three subsequent races. In 2012, he challenged incumbent Republican state Sen. Christopher Rector and captured the Knox County seat. “You can do a lot of good things in politics,” Mazurek said. Mazurek decided this year not to seek re-election, retiring from political office. He said his proudest accomplishment in the Legislature was to increase awareness of the need to invest in transportation. He served as chairman of the Legislature’s Transportation Committee. “Our roads, bridges and harbors are the backbone of our industries and economic growth,” Mazurek said. Mazurek also sponsored legislation that became law to address the problem of head injuries for student athletes. Correction: Rep. Jeffrey Evangelos of Friendship is an independent. The original article referred to him as a Democrat. Correction: An earlier version of this story listed Rep. Jeffrey Evangelos as a Democrat. He is an independent.